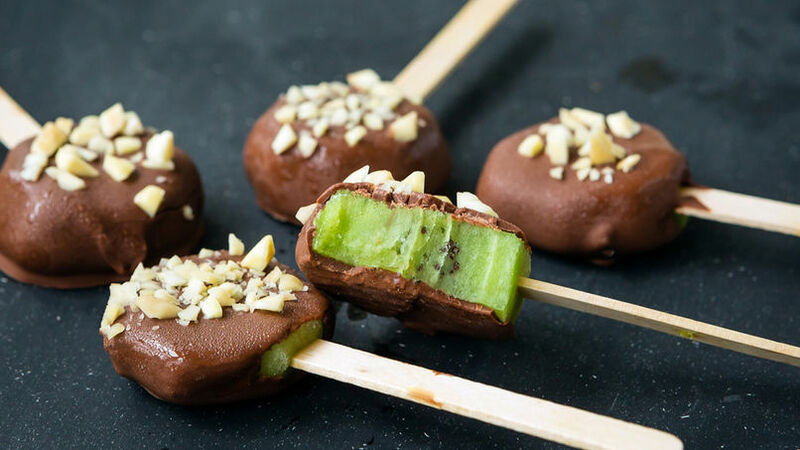 Insert a popsicle stick in the center of each slice of kiwi without piercing completely through the fruit. Arrange the kiwis on a baking sheet covered with non-stick pan lining paper and freeze for 30 minutes. Put the chocolate and coconut oil in a small container. Melt in the microwave in 20-second intervals until smooth. Dip the kiwis in the melted chocolate and let any excess drip back into the container. Before the chocolate hardens, sprinkle each kiwi with some of the chopped almonds. Rearrange on the baking sheet. Once all kiwis are coated, refrigerate for 5 minutes or until the chocolate has hardened completely. Serve, and enjoy! Store these paletas in the refrigerator. To prepare different flavored paletas, swap out kiwi for pieces of mango or pineapple. This is one of my kids’ favorite snacks, especially during the hottest summer days. Not only is it a hit, but best of all, it’s super easy to prepare, and can be stored in the refrigerator, ready-to-eat when the craving hits. Enjoy this delicacy on a stick!